Pandiraj has moved away from his usual strengths and tries to experiment in an unknown territory and gets help from Vishal who is a bankable action hero in Kollywood. A don whose nemeses outnumber the count of action films that Vishal has done is bumped off. It naturally becomes difficult to decipher the man behind this. 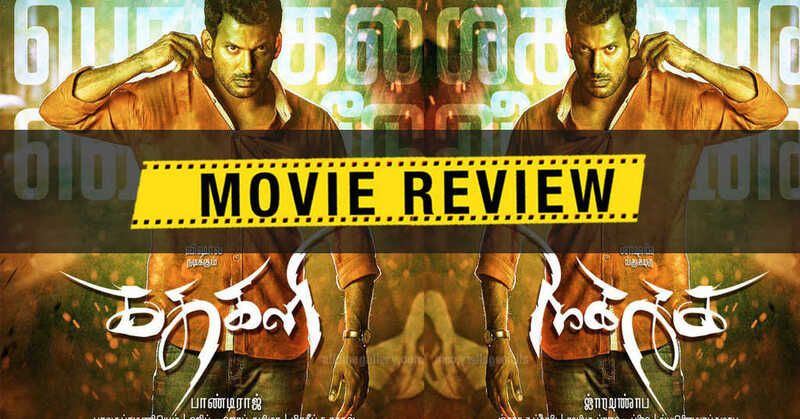 Fingers point to Vishal and he has to get out of this mess.Yes this film too is on a familiar terrain but Pandiraj has thrown in a thriller angle to transcend the boundaries of a typical actioner. Just like how one can’t identify the face behind the attractive make-up in the popular dance-drama Kathakali, as a viewer it’s almost impossible to anticipate the turn of events in Vishal’s ‪#‎Kathakali‬. It’s a no-nonsense thriller that dazzlers with unpredictable twists and keeps you on the edge of your seats till the very end. Based on true events, this story that unfolds in a single night is stylishly shot and edited. This could very well be Vishal’s Pandiyanadu of the year. The running time is a major plus as it succeeds in maintaining the tension, especially in the second half with its gripping screenplay. Hip Hop Thamizha’s score brings a nice little dimension to the film. The build up to heroism and the henchmen taking turns to get beaten to pulp does not hurt you much this time as they are kept short and there is something nice about the BGM in these scenes with the familiar Chenda beats making more impact with the sound level kept at an optimum.